Limited Spaces Still Available! Book Now To Avoid Disappointment. A once-in-a-lifetime opportunity, join Master Tapestry Weaver, Maximo Laura, on his teaching tour of Sweden in May, along with his assistant teacher, Paola Laura. 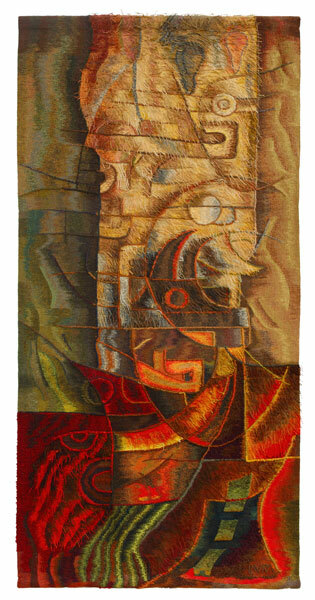 Maximo Laura is an award-winning tapestry weaver internationally recognised as one of South America´s pre-eminent and most unique textile artists. He is a consultant, designer and lecturer on art and contemporary Andean textile design. His work is the integration and synthesis of ancestral weaving techniques, symbols, memories, myths and rituals with contemporary art. Maximo will be delivering three fascinating one week workshops at different venues around Sweden, teaching many of his typical textural techniques to participants who will make a small wall hanging on his portable table looms. Maximo showing several of his techniques on a finished tapestry. Maximo’s three courses will include 40 hours of teaching from Maximo and Paola, weaving a piece on the small portable looms he has developed for this work. They will teach a number of his textural weaving techniques and his colour blending system. All necessary materials, yarn, etc is included in the price. Fristads Folkhögskola, Borås Confirmed. Places available. Siljansnäs, Leksand Confirmed. Places available. Contact us now for more information or to reserve your place on the course.